What a day! I am nearly too tired to post. I think I may have another coffee before the end of the day. I woke with Honi and Harmonie﻿ in my bed doing their best to push their father out his side. No really, at one point he nearly fell out and on trying to get back into bed head-butted me. A very interesting way to start the day. 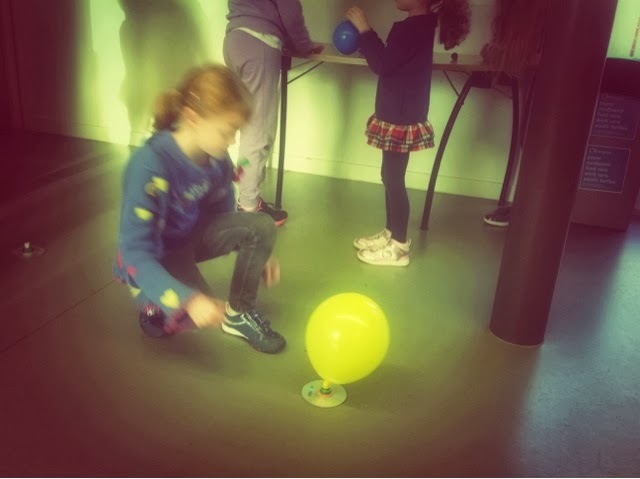 It wasn't too early in the morning however and the girls, when up and ready, were all so excited about science group. Somehow the time flew too fast and we ended up making a dash up to the group. I felt too organised - which always makes me nervous. I was right to be as I had forgotten the ice for an experiment that I knew the children and their parents would have enjoyed loads: The self-crushing can! Another experiment for another time I suppose. I did notice at group today how much Harmonie was into joining in more and more. She wants to do the experiments just like her friends. It was a little sad to see her face when I explained that she wasn't able to do all of it herself and to let the others have a go too. The experiments we did cover today was squeezing a hardboiled egg into a bottle; Rising water experiment; Self-inflating balloons; a favourite in our house which is the submarine experiment; the balloon jet; We also experimented with a homemade peashooter before going outside to have some fun with a film canister rocket! The evening was so tiring. I was tired from a non-stop busy day. A brilliant-non-stop-busy-day but still tiring! Then Honi decided to be a pickle when it came to evening meal and bedtime again and she's training up her sister I tell you! It was all too much tonight and I ended up telling her how much it was hurting my feelings and breaking my heart and on top of that I was tired out from the regular evening process that it seems to becoming. After a few tears from both of us there was cuddles and then she slept like an angel. She slept with Harmonie in the room before the clock struck 8:30pm. So I am off now and I will be back soon with another science experiment or two over the week!